A jealous mum-of-three attacked her partner’s suspected lover with a beer glass and scratched “cheat” on his BMW car. Furious Sarah Foster was suspicious Lee Foster was having an affair and using an app on her mobile phone she tracked down the location of his iPad and hastily set off to find him. Wearing a long t-shirt over her pyjama bottoms she went into the Glass Horse public house in St Helens along with her nine-year-old son at 9.30pm looking for him and the other woman. “Lee Foster had left his coat on the chair and she went through it to confirm that it was his. Witnesses described her son saying, ‘mummy stop it’ but she carried on shouting at Miss Parry. “One witness described her as striking her or pulling her arm back on two or three occasions. She then picked up a half pint glass off the table while Miss Parry was still sitting down and calling her ‘a f****** b*****’ and struck her on the back of her head at the left hand side with it. Mr Jones said 35-year-old Foster then went into the toilets looking for her partner, who was unaware of what had been happening. They both left the toilet and she tried to have “another go” at the couple but was restrained by bar staff and told to leave. “When Mr Foster left he discovered that on his BMW front passenger door had been scratched the word ‘cheat’,” said Mr Jones. His partner was arrested later that night and when interviewed admitted going the pub and confronting the pair but did not seem to recall using the glass. Liverpool Crown Court heard today that the defendant and 41-year-old Lee Foster had been married and have three children but divorced four or five years ago. They had got back together and where living together at the time of the incident. “A week or two before the incident the defendant suspected Lee Foster was having an affair,” explained Mr Jones. The court was told that the couple have been reconciled since the attack on April 24 this year and he was in the public gallery supporting her along with her mum and brother. Imposing a 20 month prison sentence suspended for 18 months Judge Rachel Smith said there was no suggestion that Miss Parry had not made a full recovery and any scar would not be visible. The judge also imposed a five year restraining order to keep away from Miss Parry. 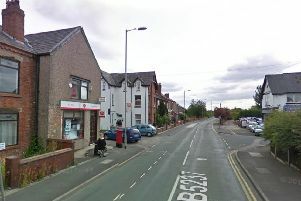 Foster, of Cinnamon Avenue, Hindley Green, Wigan, was also ordered to carry out 45 days rehabilitation activities and a curfew with an electronic tag was imposed for three months between 9pm-7 am.